Multiple iterations of the artist fall through the sky and land in water. Created for Art on the Marquee at the Boston Convention & Exhibition Center, 415 Summer St. There are seven videos in all… Of these, Jeffu Warmouth's “Fall” is the most poetic. Warmouth fills the vertical screens with blue skies and puffball clouds. Men fall through the sky, unnervingly conjuring Sept. 11, although they move more slowly than they would in real life. Warmouth has made the horizontal screen below into a swimming pool, also very blue. The men end up paddling around underwater, from one side of the marquee to the next. It's a sweet, reassuring ending. Jeffu Warmouth's “Falling,” pictured above, is one of the best, especially in its witty use of the awkward configuration of the marquee. 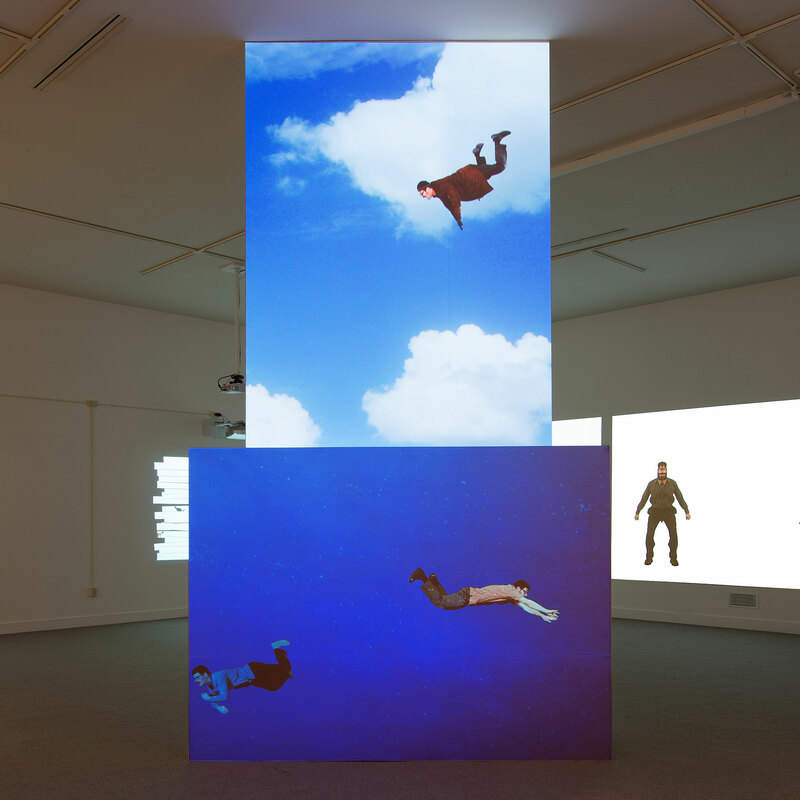 Men drop through the sky on the vertical screen, a little slower than they would in real life, and when they hit the horizontal screen, they're landing in a deep pool of water. They start swimming. Earlier this evening, I encountered the most smile-inducing surprise on my drive home from work… It's a wonderful project entitled “Fall” by Jeffu Warmouth, and a fun and fanciful use of the juxtaposing vertical and horizontal screens that comprise the marquee. 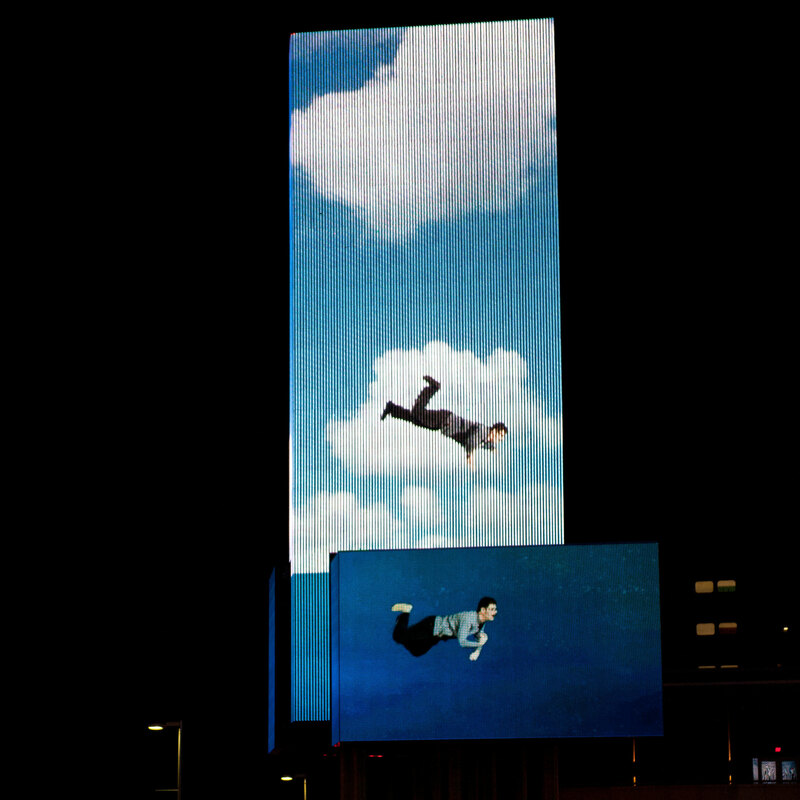 I found out later that the figures are actually portraits of the artist who free-fall through a cloud-dotted sky (on the marquee's y axis) only to change their trajectory and swim around the sign (once they hit the x axis). At the end of a long day, at the end of a long week, this digital short could not have been more refreshing. For me, it was a signal that the weekend was here and I could let all the millions of tasks on my piles of lists fall away just like the man on that screen, and prepare to be reinvigorated by whatever I chose to dive into over the next 48 hours. Fall is but one of several artists' projects selected for display during Art on the Marquee's winter cycle and I look forward to the possibility of seeing them all on future post-work evenings, when commuters need them the most.